The wooden dome of the United States Capitol had recently been completed as had the South Portico of the reconstructed White House. On January 5, 1826, William Cox placed an advertisement in the Daily National Journal for the sale of “Champaigne, London Porter, and old Madeira.” The store was located “Near the President’s House” on Pennsylvania Avenue. On December 9, 1826 the location was specified as across from the “Williamson’s Hotel.” Williamson’s Hotel was located at Pennsylvania Avenue and 14th Street where the Willard Intercontinental Hotel is now located. There was a series of five buildings arranged as a hotel for some time but operated under various proprietors and names including Williamson’s Mansion Hotel between 1824 – 1833. 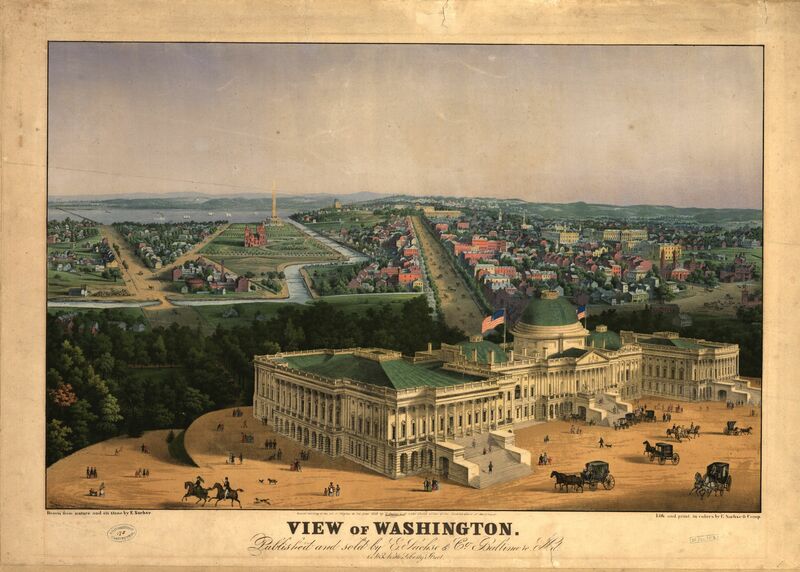 The construction of the Treasury Building did not begin until 1836 so William Cox had unobstructed views of the White House and the United States Capitol. 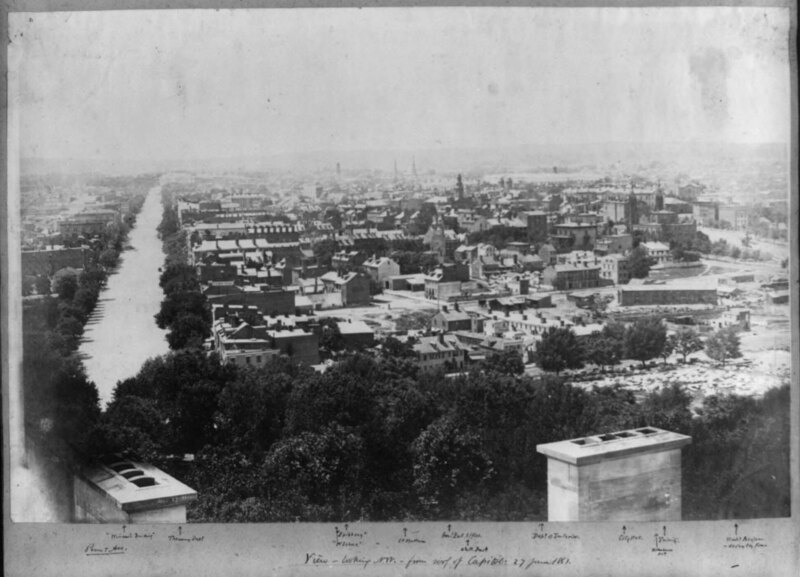 Pennsylvania Avenue was a dirt road at the time, not being paved until 1833, and the Washington City Canal had been operating for over one decade. 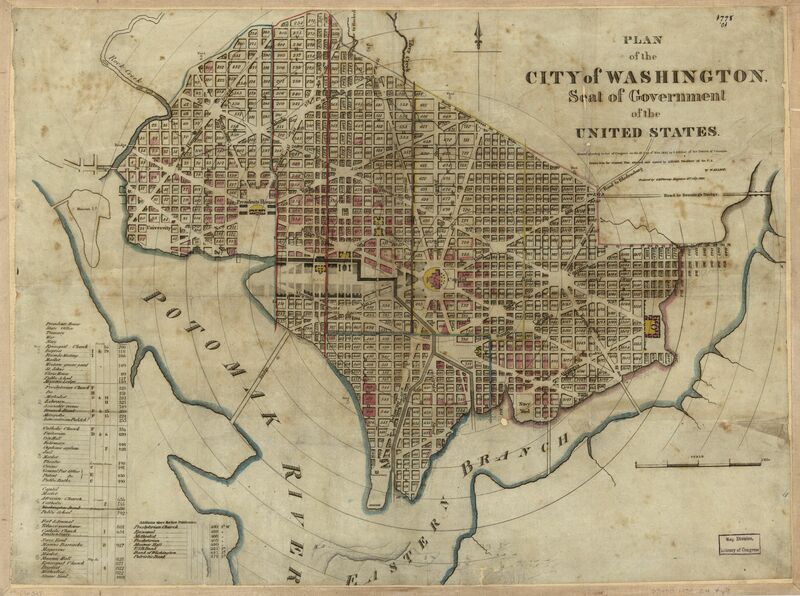 Plan of the city of Washington. William Elliot. 1829. No. 88694087. Library of Congress Geography and Map Division. 8 qr casks old Madeira, Lycock & Monteno’s Brands, vintage of 1819. This advertisement ran with unaltered contents three more times in February and March. Adjacent to the second and third advertisements ran an advertisement for “GRAPE VINES.” The grape vines referred to both table and wine grapevines supplied by John Adlum from his vineyard in Georgetown. From February to the next spring he was selling grapevine cuttings and slips for table grapes at $1 per dozen and for wine grapes at $1 to $3 per one hundred. Of the wine grapes once could purchase the Bland’s Madeira and Catawba at $1 per hundred, the Schuylkill Muscadell, the Constantia of Cape of Good Hope, the Worthington, and the “Lufborough” at $3 per one hundred. Like Thomas Cox, deliveries within Washington and Georgetown were free of additional cost. At the time, the cost of a license to sell wine “not less than a pint” was relatively inexpensive at $10. In comparison shops ’retailers of spirituous liquors at fish docks ran $10, shops that sold liquor ran $50, and those that sold wines less than a pint at $50. On December 9, 1826 William Cox advertised new stock in a different format. His list of “Old, Pure, and Selected WINES AND LIQUORS” was organized into “Wines in Bottles and Wood”, “Liquor in Wood and Bottles”, “French Rhine and Constantia Wine”, “ Old Port Wines, London Porter, Hibberts Double-Brown Stout, &c.”, “Cordials, Liquors, and Old Arrack”, and “ALSO”. This list featured “a choice selection of Wines and Liquors, which have been gradually accumulating and improving for years.” The Madeira selection was extensive. Of the “L. P. Madeira (south side)”, vintages 1814 to 1822, there were 7 pipes, 12 half pipes, 10 quarter casks, along with 15 half, quarters, and ten gallons casks. The newspaper images I looked at appear to be low-resolution, high-contrast digitized copies of microfilm making sections difficult to read so excusive the following transcription. Old London Particular Madeira was available from the houses of Leacock, Montena, Olivera, Sco Langham, Painful t & Co, Gordon, Lynch, Blandy, Aranjo, Kerr, Mauch, Corea. This stock was available in wood, demijohns, and bottles “most of which have been a voyage to the East or West Indies, Brazils, or cost of Africa.” There were 500 dozen “old bottled Madeira and Sherry” from various importers from 1811 to 1820 most of which had “undergone a voyage to the East Indies.” There was Champagne from 1820 and 1825, Constantia Wine, and Imperial Tokay. Of the claret and Burgundy there were 80 cases consisting of “Chateau Margeau”, “Margeau Lafitte”, “Chateau Lafitte”, “Gruaud La Rose”, “St Julian, Medoc”, Hermitage, “Chambertin Brugundy”, “Macen do. Latour”, “Burgundy Claret”, and “old Hoc”. View, looking N.W. from roof of Capitol. Benjamin Brown French Photographs. June 27, 1861. No. LOT 12251, p. 129 [P&P]. Library of Congress Prints and Photographs Division. William Cox advertised his wines six times from December 9 through December 18, 1826. Perhaps this was done for the Christmas season. The same advertisement resumed January 8, 1827 and continued several times per week until May 8, 1827. The Daily National Journal was published between 1824 and 1832. I have not found any other advertisements by William Cox in the Early American Newspapers Series 2, 1758-1900 which span the publication range of the Daily National Journal with some 1500 digitized issues. To address optical character recognition issues I tried other search variations which returned only a handful of additional advertisements. If the inventory of William Cox did not change then perhaps he did go out of business. It is also possible that his lease expired or the building was demolished for new construction. Near Pennsylv. Ave. and 7th St. At Washington City. Kollner, Augustus. 1839. No. DRWG/US – Kollner, no. 13. Library of Congress Prints and Photographs Division. In a quick search I could not find additional information about William Cox. When Jonathan Elliot published his Historical Sketches in 1830 he noted “a wine store” under the same roof as Mr. Gadsby’s National Hotel at Pennsylvania Avenue and 6th Street. No stores were noted near the Mansion Hotel or the Williamsons’ City Hotel. 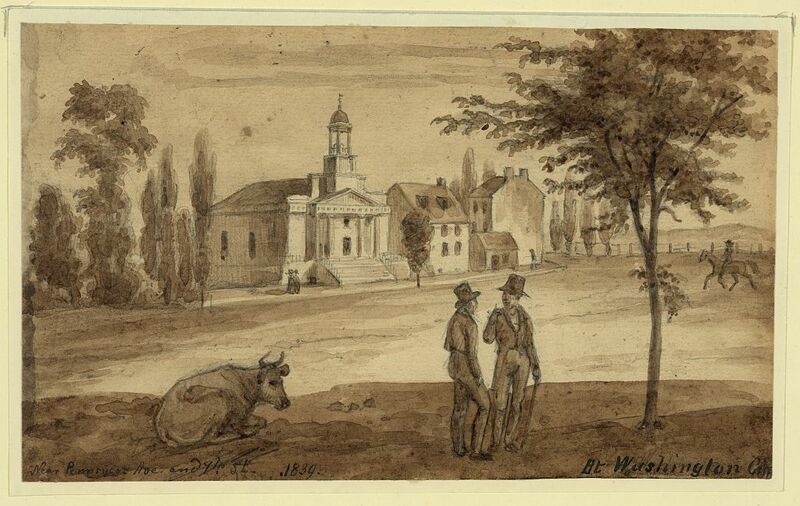 This might corroborate the disappearance of William Cox’s store in 1827. Despite the scarcity of wine stores Jonathan Elliot mentions three different vineyards in Washington, DC. The most famous of which was John Adlum’s vineyard in Georgetown which contained 20-30 different kinds of grapevines. In Kalorama the seat of the late Joel Barlow had been taken over by Colonel Bomford. Just to the east of the Kalorama ridge were the seats of Thomas W. Pairo and Colonel Michael Nourse. Mr. Pairo had “a fine thriving vineyard of the choicest vines.” Thomas W. Pairo was a real estate broker. On March 18, 1830 he advertised “VINE HILL FOR SALE OR RENT”. The property was described as that of Colonel G. Bomford located one mile north of the President’s House and near Kalorama. It was of seven acres in size “well enclosed with 5 to 6 thousand Grape Vines mostly in a bearing state.” Applications could be made to Thomas W. Pairo at Rock Hill adjacent to Vine Hill. It appears that Jonathan Elliot incorrectly attributed the vines of Vine Hill to Thomas W. Pairo. Unless, perhaps, Thomas W. Pair took over the vineyard. In addition to wine, spirits, and beer William Cox sold demijohns in sizes from quart to five gallons, hampers, “Claret Wine Bottles”, as well as “Patent Wine Bottles” in quart and pint sizes. Thomas W. Pair had his office at Pennsylvania Avenue and 10th Street. Perhaps at one point the wines of Vine Hill or those of Samuel Harrison Smith were bottled using containers from William Cox. Hanse, Stephen A. Kalorama Triangle: The History of a Capital Neighborhood. 2011. Date: Saturday, November 21, 1829 Paper: Daily National Intelligencer (Washington (DC), DC) Volume: XVII Issue: 5244 Page: 1.